Welcome! 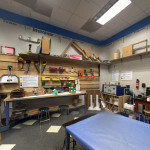 To share glimpses of the material design of makerspaces and how the spaces change over time, this page shows 360° photographs of four makerspaces I have the pleasure to collaborate with: the Digital Harbor Foundation (Baltimore, MD), the Millvale Community Library (Pittsburgh, PA), the Children’s Museum of Houston’s Chevron Maker Annex (TX), and the Make Innovate Learn Lab (Bloomington, IN). These pages are a resource for anyone looking for inspiration and ideas for the design of their own makerspace(s). I am a doctoral student in the Learning Sciences program at Indiana University, and a Graduate Research Assistant at the Creativity Labs. With a background in design and a passion for making, my inquiry centers around material patterns in makerspaces and design principles for spaces that invite equitable making. 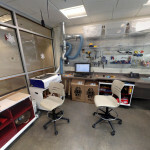 The 360° makerspace pictures are design and inquiry tools for me and my research work. After the app stitches the individual pictures together (can take a few minutes) you can share it on Google Maps. 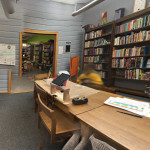 The 360° picture also saves to your gallery, and from there I upload the images to Round.me, which has a feature for storing several pictures for one makerspace. 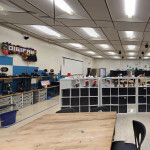 Please share your pictures with me on Twitter: @360makerspaces I am excited to see your makerspaces!